Perfect clothing and jewelry for Animal-Lovers. In our opinion, Mr. Teapot has been awarded an eternal first prize in any activity related to relaxing, unwinding, or chillaxing. Just look at that guy. He's living the dream. Oh, and he'll steep your tea and look super boss whilst doing so. Brewing your tea is simple with Mr. Teapot. 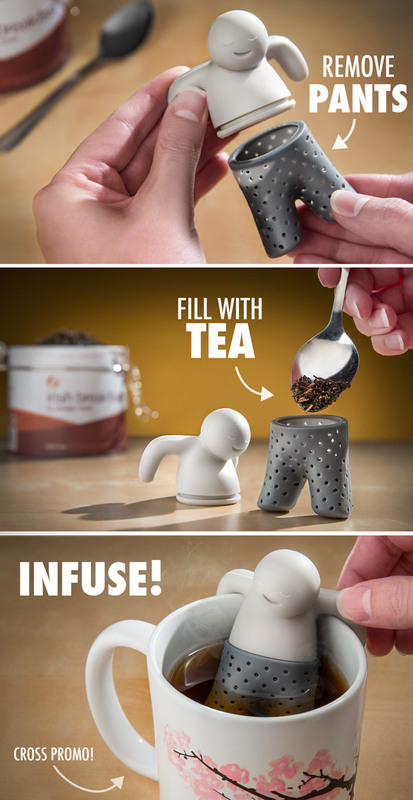 Remove his little pants, spoon in your loose leaf tea, and rest him on the edge of your cup. Done! Although Mr. Teapot looks like he's never worked a day in his life, he's robustly designed to deliver one task repeatedly: steep your tea! His silicone body and pants are dishwasher safe, microwave safe, and can withstand temps up to 450ºF (232ºC).